What you find in that search then informs your purchasing decision. And, 90% of consumers read online reviews before visiting a business and 85% of consumers trust online reviews as much as personal recommendations. On this episode of the Senior Care Growth Show, we talk to Aaron Clifford, Senior Vice President of Marketing, Binary Fountain about how reputation management is critical for senior living organizations. Winston: Welcome to this episode of the Senior Care Growth show. My name is Winston. I’m super excited today to be joined by Aaron Clifford. He is the senior vice president of marketing at Binary Fountain. Today we’re going to be talking about a really important topic in the senior living industry and that is the importance of reputation management. Aaron, welcome to the Senior Care Growth show. Aaron: Thank you so much, Winston. Happy to be here. Winston: Just by way of introduction, maybe you can tell people a little bit about who you are and what it is that you do. Aaron: Sure. So, I have been with Binary Fountain a little over a year and serve as the senior vice president of marketing. I oversee all the marketing and communication efforts that Binary Fountain has. Prior to Binary Fountain I was with HCA, which is a large hospital healthcare provider. I was with them for 15 years, left the company running as the senior director of digital marketing solution and I oversaw marketing technologies, served as the business owner for the 900 websites. And then while I was at HCA, I developed the first online reputation management platform and department and created the business case and won the business case and created the reputation management for the 800 clinics and 173 hospitals. I loved Binary Fountain, they are a vendor that I chose when I was at HCA and loved the whole online reputation management and brand management, consumer experience space, so thought I’d join BInary and have been having fun ever since. Winston: Yeah, that’s great. And just so for folks who aren’t familiar with Binary Fountain though, maybe explain what it is that Binary Fountain is and how it helps with reputation management. Aaron: Sure. So Binary Fountain is a consumer experience platform, where we help enable companies and brands to manage their online presence, what’s being said about them on various review sites and specifically, not just the sentiment of what the star ratings are for the particular position or business, but actually what are the consumers or in healthcare patients saying about their care. We have a natural language processing component of our software that goes through and analyzes each of the comments and then provides better insights to the brands and companies that we serve so that they can make improvements to the customer experience. We also help companies generate more reviews and in healthcare it’s very difficult, but also in the multi-family space and other protocols it’s very difficult and it requires somewhat of an art and just somewhat of a process to get that. So we help enable those. And then also we provide, we’ve done analysis on all 800,000 physicians in the United States and most recently US News and World Report announced that they are using our data to power their patient experience profiles for all of the physicians that are on us news and the world report website. If you go to a physician, you’ll see under experience powered by Binary Fountain. So we are also sort of a data analytics company and provide data to other organizations. Winston: That’s awesome. I think in the senior care space, reviews and an organization’s reputation is incredibly important. It’s a really considered purchase. Why do you think that this is such a valid topic for marketers and sales folks in the senior living industry? Aaron: I’ll start really high level, according to a Bright Local study in a 2017 survey, and if you’ve not looked at the Bright Local survey that they do annually, very important as a marketer to look at the stats there. So I’ll just start broad. 97 percent according to their survey of consumers look online for local businesses. 12 percent of consumers look for a local business all the time. So just starting at that broad perspective is huge. People are going online to find services and local businesses. And then are the reviews and the ratings trusted? So in this same survey said, 85 percent of people they trust online reviews as much as a personal recommendation. So as a marketer, you can be spending all kinds of money on billboards, on your SEM approach on social and content marketing. All of these efforts, which are good efforts and you have to do, but reviews and ratings are standing in the way of that new revenue. So whether it’s senior living business, healthcare, or whatever other business, you’ve got to pay attention and have a strategy and approach of knowing what’s being said about you, and then also, how you can respond appropriately and do service recovery. Winston: Yeah, that’s great. That’s, that’s a pretty staggering statistic. The fact that 85 percent of people trust online reviews as much as a personal recommendation says a lot. I know that whenever I even buy a consumer goods product, I read through all the reviews on Amazon and this is about much weightier decision. So people are obviously going to do their research. Aaron: Absolutely, and I would say in a senior living space where there is oftentimes research that is being done remotely. So, while the daughter lives in Austin, Texas, while her mother lives in Albany, New York, there’s going to be a ton of research by that daughter to look at that local businesses in Albany, as they may not have friends in that particular area. It is probably going to be even more trusting online reviews or making some decisions based on those reviews in remote situations. Winston: Yeah, that’s a good point. So, if I’m a marketer and I’m working at a senior living community, I have a million things to do, I’m giving tours, I’m trying to manage the website and everything else. How much time should I be dedicating to reputation management? Aaron: What I had recommended when we are implementing this and we did it manually first for about 20 clinics and we just had a sort of step by step guide of what they should be doing to set up a reputation management program. And really what it came down to is probably about 10 minutes a day, 10 to 20 minutes a day for one single facility. Because you’re looking at what platforms are out there and you’re just going through and you’re checking are there any new reviews and of course subscribe to the platform, number one, claim your listing on those platforms. If it is Google My Business, make sure that you’re the owner of that profile and then you have alerts setup to email you when there is a new review. And Facebook, of course you’ve got to own that if there’s comments there. So you just have to be aware and it’s probably 10 minutes a day, 10 to 20 minutes a day. Some days it’s going to be more because there’s going to be some comments and it’s going to take time to know how to respond to those comments, positive and/or negative. So, some days your day might be consumed with three to four hours of talking to different individuals and seeing how you can manage it. But on average I’d say 10 to 20 minutes. Winston: Yeah, that’s great. That’s not too much time and that’s actually a lot less than I would’ve thought. I guess the only way you’re able to spend that little bit of time though, is probably by having a good system of what to do so you’re not just kind of floundering around. You need to know what to do with that time. How should marketers manage their online reputation and how do they generate some positive reviews, not just address some of the negative reviews. Aaron: My recommendation is look at the top five to ten platforms that you have a presence on that there might be a review on. And so the first step is to make sure that your address and phone number are correct on all of those listings. For example, Google My Business, Yelp, Facebook, Four Square and other directories because you want to make sure that your listings are strong, the address is right and that the website that’s on those listings is correct. And then decide on the top five. On these five, decide that you’re going to look at these in this profile and are going to keep tabs on these five first. This is just basic 101. Then, have a systematic way of determining your approach when you get a positive review and how you respond to it. Don’t necessarily have a template, but rather a framework of what you want to say and cover, but remember to personalize each response if possible. Make sure that you have that and you can just create your own little toolkit. We also have some resources on the BinaryFountain.com site that can help you, such as ebooks that can assist with getting you set manually. For negative reviews, it’s important to have a system and process around how to respond to negative reviews. Then, start monitoring and seeing what the cadence is and if there are any reviews because there may be no reviews or very little reviews, which asks if these reviews are really representative of our business. The reviews that are out there or the lack thereof. So to your point, how do I generate those reviews? That’s a tricky one because you have to be careful of how you go about asking for reviews and soliciting those reviews. Aaron: So, there’s a lot to that particular segment and in the reputation management process, what I would recommend is that you start small and just do a test on those that you have a comfortable relationship. As the marketing person at the senior living facility, work with the patient access and the care member teams and see who they have a good relationship with and who might be willing to help us get the word out about our facility and the good work we’re doing. But, start small and ask them “would you mind leaving us a review?” And then you can get into a more automated way of review generation. You have to be careful because you don’t want to just ask the people who are happy because that may not be representative. So our approach and my personal philosophy and Binary Fountain’s philosophy is if you ask everybody, but I would say start with a pilot just to get your sea legs up about you. Winston: Yeah, that’s a good point. I think to your point too is just start with a few people you have a good relationship with. You can let them know that it’s coming and what they need to do and figure out the best method for soliciting those reviews. Is that something that you would recommend folks do in the form of an email that they send or should you use a tablet in person or how do you recommend they even capture those reviews? Aaron: Email is going to be the first step, which is helpful. Again, senior living is going to be, depending on who your audience is and who your customer is, sometimes it’s the the caregivers of your resident, they are going to be a sort of the target of who you would ask because they’re going to have an opinion rather than the actual resident. But, it could be the resident as well, just depending on the situation. If you have their email address, that’s a great way of getting it out. Personalize that message and send them an email directly. The other way is a tablet, which works well in an outpatient setting, but then there’s also the good ole fashion mail, postcard or print collateral. Aaron: Consider leaving us a review on your experience on Google My Business. Pick the platforms that you would like to target. If it’s Google My Business, then direct the caregivers and your audience to that particular platform or if it’s Facebook to that one. I will say that it’s important to keep in mind and be aware of each platform solicitation guidelines. For example, Yelp would rather you put a ‘Visit us on Yelp’ sticker on their business than asking your patrons to review you online. And so Yelp has come out very aggressive on that. And they stand alone in that and I get their stance, they don’t want manipulation of reviews, they don’t want just positive reviews, and they think that it’s wrong for people to ask for reviews. Aaron: Other platforms have not taken that stance and that’s not our stance, but, just be aware that Google has a policy as if they think that you’re just sending positive reviews, they’re going to remove them. So my approach and philosophy and Binary Fountain’s approach is, you just ask every patient good or bad, and if it’s bad, you can respond to it and do appropriate service recovery. Don’t respond to every single review because sometimes some reviews are so out there. And I can probably create a website with all of those ‘Like this is a review you don’t respond to’, but for the most part you review and try to be that particular case taken offline. What we’ve seen is with many of our customers by responding in caring, like that’s the number way to gain respect with the reviewer. By responding, we’ve seen many of the patients or patient’s caregivers come back and update the review. “Hey, the facility/hospital took care and I really appreciate them reaching out after I left a review.” So there’s great opportunity there. It’s kind of just being human, right? Just being a decent human, but sometimes it’s hard to know how to respond to that online. Winston: Yeah, so that’s a good question. People run into that where they get a negative review and the initial reaction (maybe they are even familiar with this customer) and their initial reaction is to tell their side of the story and maybe the customer had one experience, but it wasn’t representative of what actually happened and they’re just ready to jump in and say, “well actually this is what happened”. And so many times you see that blow up in the business’ face because it becomes this public back and forth and like you mentioned, taking that conversation offline. How quickly should you respond to negative reviews? What should you say? What’s some good verbiage that some of our listeners can use to successfully diffuse that situation and handle it somewhere less public. Aaron: We never encourage a back and forth. We’ve seen plenty of examples of that. In fact, one time we saw a physician arguing with one of their patients and saying they got a negative review and this physician logged on to the Google My Business page and start arguing with the patient and calling him a drug seeker and saying ‘that’s not true’. Don’t do that. Our recommendation is to respond within 24 hours, do appropriate research if you know if there’s any information given and then simply reach out and on the review line you say, for example, “Thank you for sharing your experience. We always strive to provide the best service. Your review is very concerning to us. Please call us at and provide that phone number and have a real human being pick up the phone.” So when that happens, you’ll see that oftentimes the caregiver or the patient will call and say, “I love this review, thank you for reaching out” and that’s where we’ve seen them go back and update the status. You don’t want to get into the details of the specific item, even if it’s blatantly untrue, just don’t argue around their side of the story and your side of the story online. You simply say, please reach out. And sometimes if they don’t, at least you showed that you were willing to engage and that’s important to folks who are looking at your business and considering how you would handle a situation. If it just lives out there on its own, then there’s a brand perception that is made and that may not be beneficial to your business or representative of how your organization’s culture and way of practicing. So it’s very important. I’d say within 24 hours is best case scenario. Even if it’s three days though, respond. Don’t go back two months or a year-don’t do that, that’s fine. Just say, all right, this point forward, this is how we’re going to respond and that’s okay. Winston: Yeah, that’s great, that’s a good call. And I also really liked the idea of listing a phone number rather than an email address because I’ve learned that whenever I have a difficult conversation in business or otherwise, if you try and handle that in a written format, it can be much more difficult to get to the root of the problem quickly, show that empathy and that you really do care. And I think having the phone number as the next point of action is a really good call. The question related to that is who should you have on the other end of the line? What type of person or what role within the organization should be fielding those requests? And what level do you think should, should that person be. Aaron: What I would recommend as a starting point for a single facility, assuming you’re just self-containing you’re managing, you’re not a part of a large enterprise system. So, what’s good for the single facility is oftentimes good for the enterprise. You just have to find ways to scale the different programs up and across. So just assuming that it’s a single facility, the marketing director, if there’s a chief nursing officer, head of patient care and legal should come together with a plan to determine how they are going to respond and who’s going to respond. And so oftentimes, depending on the case, you may need to provide the phone number of the chief nursing officer of the company and say, “talk to me directly” and give their name and phone number and leave that in the review. Aaron: Other times, it’s going to be the marketing director as the contact. Stating “please reach out, I’d like to talk to you more”. That’s where we see most of our customers, their internal plans and the numbers that they give, whereas, larger organizations have sort of the Patient Access team and they have a phone number for patient relations. This might not be their call center, but a specific unit within their call center that knows how to handle those and then escalate it appropriately. So that’s where I’d start, depending on the staff, depending on how many folks you have in the organization. You want the phone number to go to somebody who could actually resolve it and you’re not passing that patient or caregiver to three to five different people. That’s never good. We’ve seen people do that and they go back and they update their review and they say, “I’ve talked to six people who can’t give me an answer on fill in the blank”. You should have given the phone number to somebody who can actually do something or at least fast track the issue for service recovery. Winston: Yeah, that’s a good point. I think having that single point of contact for sure, because then the person with the negative review hasn’t had to tell their story multiple times. It makes it even worse and that’s a nightmare. Aaron, another question for you that came to mind, if I’m that senior living marketer and I know that my online presence is important, reviews are important, there are several places where those reviews can be left. And in the senior care space, places like Caring.com or A Place For Mom or Google, like you said, Yelp, lots of different platforms. If you’re spearheading an initiative to improve your online presence and reputation online, which platform should you focus your energy on and do you give the patient or the resident the option to leave reviews on multiple platforms? How do you handle that? Aaron: Our recommendation is that when you were working in a particular area, determine where the most reviews are located. If it’s pretty much equal, Google, Facebook and wherever, then you need to give some thought about your consumer journey? What are people using to search for or get recommendations for your facility and what’s that path look like? So, if it is an insurance site and consumers are looking at what’s covered under insurance and then they’re just going to go Google your name, like a branded search term, then you are going to focus on Google My Business. 96 percent of all searches on the Internet, on a mobile device are Google searches, so most likely, so make your focus on Google. Aaron: Facebook, people are asking their friends and you look at your Google analytics and it looks like you’re getting a lot of referrals from Facebook or not maybe a lot, but even if it’s five to ten, where people are linking to you, then make sure that you direct people to Facebook to leave feedback. I would also say don’t underestimate, and this is another approach to reputation management is first party reviews. So if you have a survey that goes out to your patients and caregivers, consider adding reviews and being transparent on your own website. It’s very powerful that in first party reviews and Google loves them, as it helps from an SEO standpoint, but also helps consumers get an idea. Be transparent, de-identified PHI (Patient Health Information) and post some of those to your website. That requires a little bit more work, well not more work, but it’s just a different initiative in a different part of reputation management and something that we focus in on. Press Ganey is a preferred partner. and we get all the patient satisfaction survey information and we are able to publish those for each position. You can look at doing that, either manually or finding a solution provider to do that. Understanding your consumer journey and then seeing that some people are getting referrals off Facebook or it looks like people are going to Yelp. Let’s focus on just making sure our profiles is up to date and let’s stick a ‘Visit Us on Yelp’ sticker on the window. I’m not real prescriptive on ‘always do Google or always do Facebook’, as it really depends on your particular area that you’re in. Also, don’t discount your competitors and see where they’re performing well. So competitive analysis is a big part of the reputation management platform, you need to know how your competitors are faring online and where folks are going to review them. And then that might go into the decision. Winston: Those are all good points. Look at your customers and the customer journey. Go back to your personas, it’s what we always say in marketing-it’s core is focused on the customers and then a competitive analysis and also looking at the data and where traffic is coming to your website from and what have they looked at before coming to your website. I think those are all good criteria for figuring out how to prioritize which platforms you want to focus on. Another question is, we’ve talked a lot about how to do this sort of on your own and how to spend a little bit of time and manage this in house. Obviously, that takes a lot of time and energy. When does it make sense for an organization to look at either a partner agency or a platform like Binary Fountain, when should they look for external help and what are the kind of next steps there? Aaron: Yeah, so I would say if it’s looking like this initiative internally is just falling by the wayside and you’re not able to give enough attention to it, it’s falling through the cracks, will then consider a solution. You know, either an agency partner that’s helping you manage where it is their responsibility, or a particular platform and software solution, the larger you get and maybe the more volume you get, the more attention that’s going to need to be given to it. Start small. If you’re not doing anything, just start somewhere, start manually, but then you’re going to potentially realize as your initiatives are growing that you’re going to need a place to know what’s happening across all hundred review sites out there and where you’re being mentioned and what you potentially might be missing on just the five you are focusing in on. Aaron: There’s some other ones that you might be missing. So then that may make sense to have a system. And then as you get more sophisticated, there are reports, such as Closing the Loop reports which show ‘was this customer responded to?’ One of our larger customers, they responded to over 60 percent of the 88,000 reviews that they received last year, which is powerful. But they were able to get those metrics from our system. So as you grow, there’s probably going to be a need for you to get with an agency partner, maybe that’s the next step, potentially just depending on how big you are and how many reviews are getting, followed by a full fledge system. Start, small and then grow it out. And then if it’s just overwhelming, you might just reach out and say, hey, I need some help from Binary Fountain. Winston: Yeah, exactly. We know someone good at Binary Fountain we can put folks in touch with. So, we’ll list your contact information Aaron. It’s great to talk to you today. Any other kind of parting words of wisdom for the audience? We’ve covered a lot today on how to organize your reputation management efforts, what areas to focus on, how to prioritize, how to respond to negative comments. I think we’ve covered so much good tactical advice. Any other parting words of wisdom? Aaron: I would just say, overall in all of this, this is caring and empathizing with your customers. So by caring, which so many of you do, you care well, this is a component that is a digital means of showing that you care to the world of those people who are giving you feedback, good and bad. And so just continue to empathize with your customers and providing the awesome service that you do already provide, but then realize that this other area of online presence management is so important and it’s letting others know about the good work that your employees and your organizations doing. So keep up the good work. Winston: Great words of encouragement and I love the thought-it’s sort of like taking credit for that care and empathy that’s already happening within the organization and doing it in a way that from a prospect standpoint is unbiased. It’s not coming from a marketing or sales person trying to convince you of this message, it’s people within the organization or customers within your organization filtering that message up and out. And I think that that’s a great way to look at it. Well, Aaron, thanks so much for the time today. This has been an excellent conversation. I’m sure that our listeners and viewers are going to take a lot from this, so I can’t thank you enough for being on here. Aaron: Thank you so much. I appreciate you having me. It’s been fun. Thank you. Winston: Yeah, for sure. Thanks everybody. 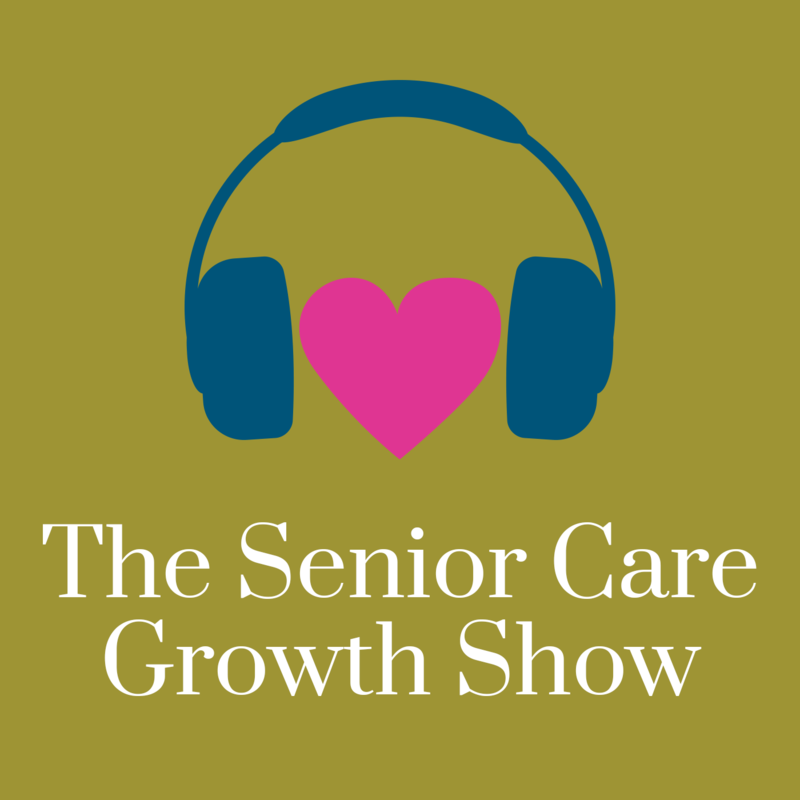 You’ve been listening to the Senior Care Growth show where senior care sales and marketers come to grow. My name is Winston. We will talk to you soon. Thanks a lot.